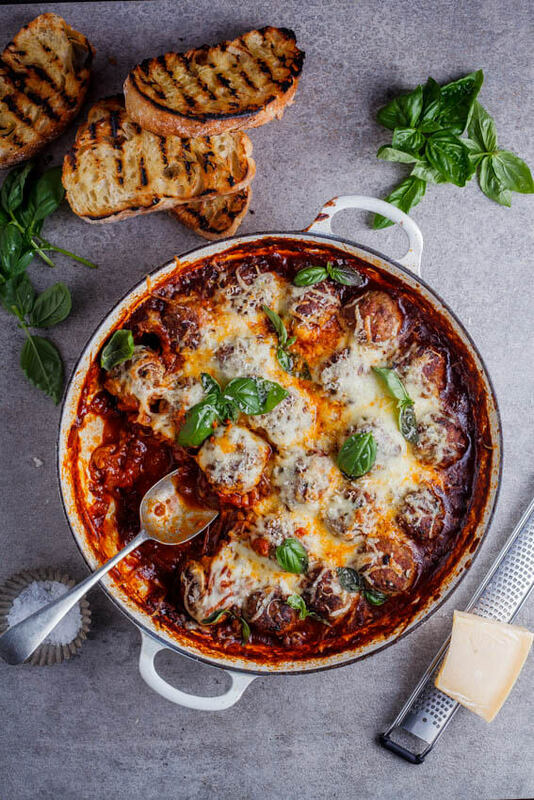 Herb-flavoured baked meatballs cooked in a rich, garlic-infused tomato sauce topped with cheese and baked until melty and delicious. Here we go again. 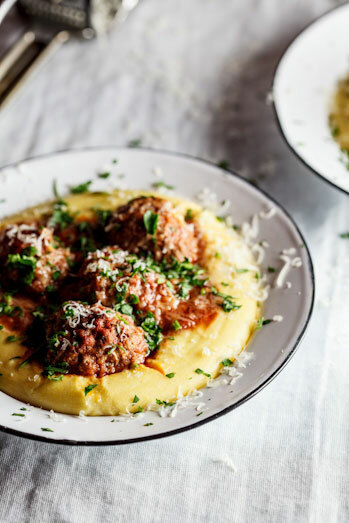 Another meatball recipe because let’s face it: I have a problem. But here’s the thing, this is not just another meatball recipe. 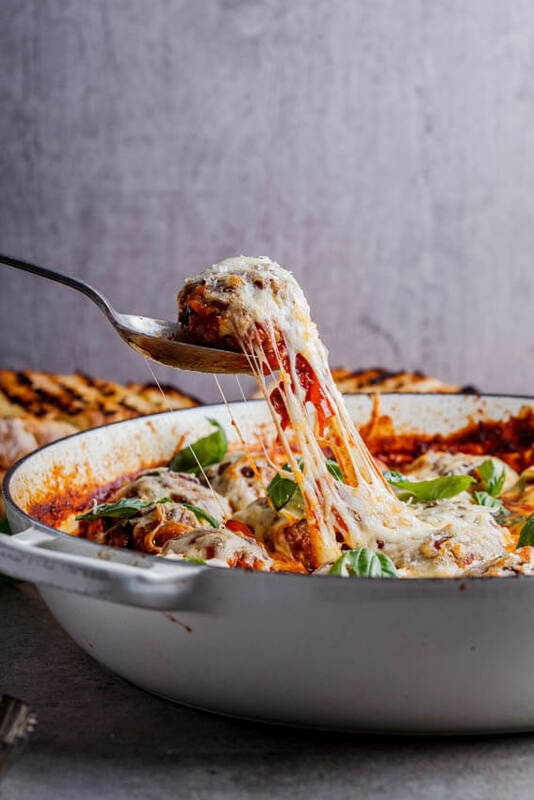 It’s topped with so much cheese and baked in the richest tomato sauce and is everything you’ve ever wanted in a meatball recipe. Because cheese makes everything better (forever and always). Don’t you just want to stare at that stringy cheese for the rest of eternity? It is just so mesmerizing. Just look at it. LOOK! 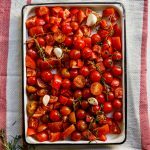 And then the meatballs are nestled in that rich, glossy tomato sauce that is flavoured with garlic and thyme and rosemary. The magic to this sauce is the little brown bits that are left over in the pan from browning the meatballs. As you’ll know if you cook stews/curries/soups, those brown, almost burnt on bits at the bottom of the pot is always the key to incredible depth and flavour in those dishes and that is no different here. And it’s that caramelized meatiness that makes you go “oooo, yum!” while eating this. Another trick with meatballs is to always (and I mean always) add more seasoning than you think. They really can handle it. To check that your meatball mixture is well-seasoned, fry a little bit of the mixture in a hot pan before you start forming the meatballs. There is nothing worse than sitting down to what you expect to be a delectable meatball and then discovering that they are bland and under-seasoned. I served the meatballs with griddled slices of ciabatta bread because I simply love dunking the bread in the tomato sauce but also, when the meatballs are served on top of the bread, it becomes very meatball sub-like and any Friends fan will appreciate that, amirite? So now, if you’ll excuse me, I’m going to stare at that melty, gooey cheese for the next hour while drooling on my keyboard before commencing with my day. 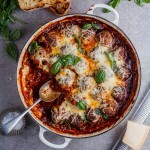 Herb-flavoured baked meatballs cooked in a rich, garlic-infused tomato sauce topped with cheese and cooked until melty and delicious. 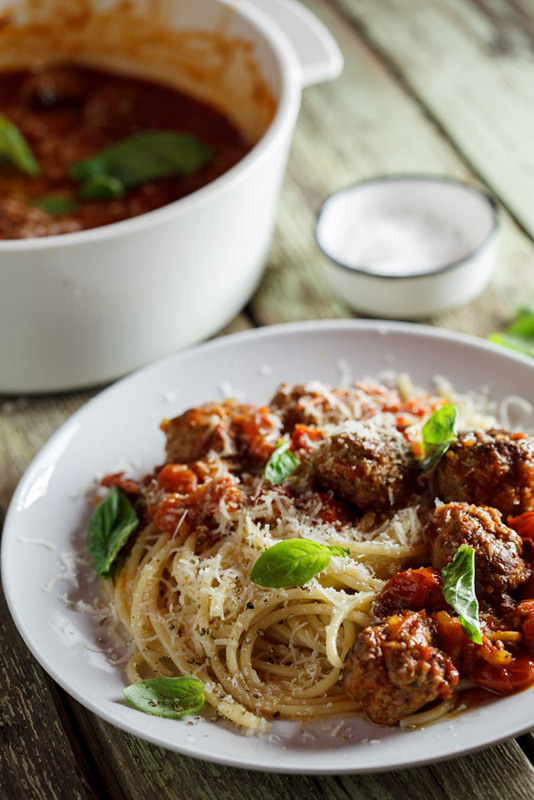 To make the meatballs, fry the onion and garlic in a splash of olive oil until soft and fragrant. Allow to cool. Place the pork, beef and onion mixture in a large bowl. Squeeze the soaked bread slices to get rid of any excess milk and add to the meat. Add the herbs salt and pepper then mix well. Fry a teaspoon of the mixture in a hot pan to check the seasoning and adjust accordingly. Form golf-ball sized meatballs and place on a clingfilm-lined tray. Brown the meatballs in a large, oven-proof pan then remove and set aside. To make the tomato sauce, add a splash of oil to the pan you used for the meatballs then fry the onion and garlic until soft and fragrant. Add the chopped tomatoes, tomato paste, beef stock, herbs, sugar and seasoning and allow to simmer, uncovered, for approximately 10 minutes or until the sauce has reduced by a quarter. In the meantime, pre-heat the oven to 200°c. Place the meatballs back into the sauce then place the pan into the oven. 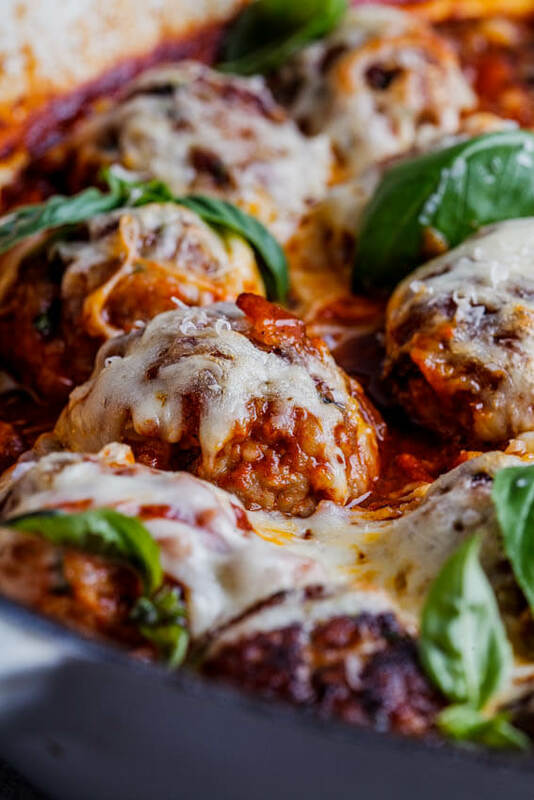 Allow the meatballs to bake for 10 minutes then remove from the oven and top with cheese. Place the pan back in the oven and allow the cheese to melt. Serve with griddled slices of ciabatta. My son Casey is going to go crazy over these Alida! I’ve been meaning to try a cheese stuffed meatball but haven’t gotten around to it. Looking forward to trying your recipe! I’m sure he will Mary Ann! Would love to hear what you think! The whole family loves it…. 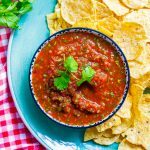 Great recipe and love your photos! The soaked bread definitely bind the meat. The meat itself also binds naturally so the eggs are just there for extra stability and moisture. So glad you like this recipe. Does this recipe make extra sauce? In other words, would I be able to serve with pasta? I prefer the bread dipping method myself, but my husband will be looking for the pasta underneath. Yep, there’s definitely enough sauce to coat spaghetti but if you’re worried about that, add another 1/2 cup beef stock to ensure it’s nice and saucy.